I’ve seen the dance by Tamasaburo many times, but this version was special, perhaps because his subdued though utterly elegant interpretation so perfectly highlighted the beauty of the story and the music, or perhaps just because a garden near where I live, Hamarikyu, has herons. Now, I know they are so still, perched on a rock with their crooked necks, as though they know but don’t care they are forming a perfect picture for an artist, so intensely focused, ruthless in their silence and stillness. What a bird it is _ and what an image, forlorn and fantastic at once, to depict the love of a Japanese woman. It is not necessary to have seen herons every day or be a Japanese woman to appreciate this gorgeous theater piece. 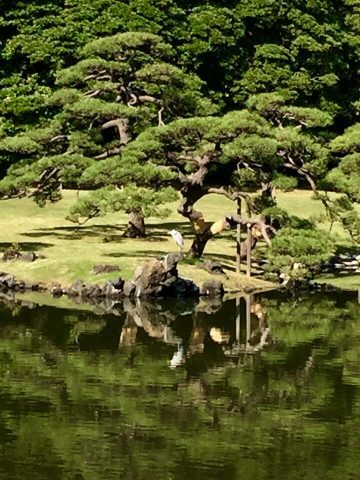 And I thank the god of poetry for giving me the gift that allows me to witness how this great Japanese dance and the humble dignity of the heron can transcend the finitude and pettiness of society. 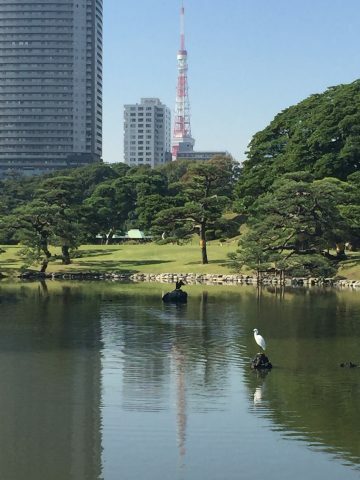 Heron in a Tokyo Garden.